Bram Stoker is famous for his novel Dracula, the named linked in modern times to Vlad Tepes, the son of the dragon and quite a few associations between the seaside town of Whitby, England are reflected in his book. Fanny Harker was for many years the landlady to Stoker and used the family name in honour of that friendship. Stoker was married with one child, Noel, whilst on holiday with his family a local tragedy seemed to have inspired a well-known part of his book (if not a great deal). Chapter 7 is where the Russian ship the Demeter rolls in, unmanned bar a dead man’s hand which seems to have originated from an incident when local small fishing vessels (known as Cobles) were doing their usual business. One was off the towns harbour when from the mists a large ship came out in front. Frantic cries from the fishermen went unheard and the ship carried on towards the coble. It upturned the small vessel as it hurt and drown two of the crew in the process, it then carried on sailing and disappeared into the mist. The “great storm” mentioned did occur, many bad storms had hit the coast over the years but it is generally accepted that Stoker meant the one from 1861. Much of the descriptions he gives for Whitby are still pretty accurate for today, visitors can follow historical trails for both Bram Stoker and Dracula inspired looks at the town. Whitby has many local landmarks and good views, including ones over the harbour where you can still see fishing vessels and crew at sea. Dalkeith, Lothian, Scotland has been given mention in vampiric tales thanks to a murder trial that left James Spalding going to the gallows in 1638, convicted of murder. The story goes that he prayed he would not die until he had found a way to reconcile with God. He did not die at the scaffolding and instead was buried alive. The results was ‘a rumbling and tumbling in his grave that the very earth was raised’. It is also said that his former house is still haunted after he rose from the grave and crawled back to town. Additional bits? Well it seems that the source of the story is not vampiric, although mentioned on the History Channels Vampire Secrets series… the source comes from ‘Satan’s Invisible World’ published in 1685 by a gent named George Sinclair and whilst it mentions him coming back as a ghost it does not mention anything about a physical body rising from the grave. Whilst the story may have adapted or been changed the basis of this one seems more with the other plane than it does with earthly risings. Another blog on the matter. 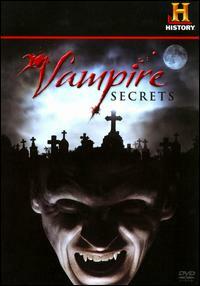 “Vampire Secrets” by Derived from a digital capture (photo/scan) of the VHS or DVD Cover (creator of this digital version is irrelevant as the copyright in all equivalent images is still held by the same party). Copyright held by the film company or the artist. Claimed as fair use regardless.. Licensed under Fair use via Wikipedia.